Winter is a fact of life in Canada, and one of the best ways to take advantage of the snow and ice is to get out there and have fun. 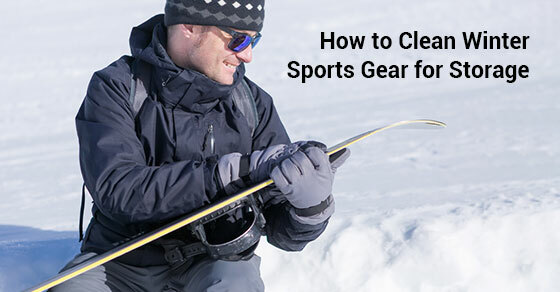 Winter sports gear can be very space-consuming, especially if you’re an avid skier or snowboarder! It’s handy to have a self-storage space to put your winter sports gear in during the warmer months. Before you stow away your winter gear in your self-storage unit, it’s important to clean everything thoroughly. Annual deep cleaning allows you to closely inspect the condition of your items, taking note of any dents, scratches, or stitching problems. Cleaning everything off also removes dirt that will degrade your equipment if left on. Cleaning your equipment helps stretch out their lifespan, so you don’t have to buy new gear as often. We’ve laid out some cleaning guidelines for the most common winter gear. After you’re done cleaning, you can bring your equipment to a self-storage space with 24-hour security and climate control so you know it will be safe and sound. Whether or not you’re into winter sports, every Canadian needs their boots. You never know when a snowstorm will hit, and regular shoes are definitely not cutting it in that scenario. Boots make direct contact with the ground, and a medley of snow, ice, slush, salt, and dirt. This builds up on boots and leaves a crust. A good pair of boots can last years if they’re cared for properly, but will probably only last one season if they’re not cleaned up. Boot care starts before the first snowfall. Buy a protective spray, and give your boots a thorough coating. This spray will protect the material of your boots from highly corrosive, dehydrating substances found on the ground. To clean your boots off before putting them in storage, mix up a solution of equal parts vinegar and water. White vinegar is the cheapest and most acidic, so it will be very effective. Spray your boots, then wipe off the solution with a cloth dampened with warm water. Let your boots air dry. For suede boots, don’t use any vinegar on them. You can use a dry brush to scrape off the crust of salt, then buff with a soft towel. Suede shoes are often sold with protective sprays; reapply a coating of this spray, then let air dry. Your boots are now ready for summer storage. Clothing like snow pants, insulating hats and mittens, and winter coats are a must for anyone who spends time on the slopes. This type of clothing does not need to be laundered every time it’s used, but a few times throughout the season is certainly a good idea. Before you put away snow clothes for storage, make sure they’re nice and clean. That way they’ll be ready to use for next winter, and any dirt or odours won’t be ingrained. Most winter clothing is machine washable. Use the gentlest detergent you can find, and wash on a low impact setting. Do multiple loads if you need to. It’s important not to overload your washing machine; it will prevent anything from being properly cleaned and may damage the clothes’ insulating properties. Snow clothes should be in sunlight. Never use a dryer on snow clothes. Dryers can also remove snow clothes’ insulating qualities. At the end of the winter season, give your skis or snowboard a thorough waxing. Waxing will preserve the moisture in your equipment, preventing it from drying out. Apply one coat of wax, let dry, and then apply another coat. Ice skating is as quintessentially Canadian as maple syrup and politeness. It’s important to take care of your ice skates so they don’t form rust, which will harm the blades. Wipe your blades at the end of a skating session, and slip on rubber guards. Before putting your skates into storage, re-wipe the blades with a soft cloth, and then place your skates on an absorbent surface. This will ensure that not even the slightest bit of water will get at your skates in storage. Care for the boot portion of your skates as well. Use a dry brush to remove any bits of debris from the boot, and use a soft cloth to polish. If you’re going to go through the effort of breaking in a new pair of skates, it’s worth it to take good care of them so they last for years! It’s so important to clean your winter gear before putting it away in your self-storage unit. Imagine next winter: you open up your storage unit to find salty, scruffy, and smelly gear that needs hours of cleaning. Or, you open up your storage unit and are greeted by the site of your pristine winter equipment, ready to be used right away. A small investment of time and effort before you put your equipment away will really pay off! For the best self-storage units for your winter gear, contact Jiffy Self-Storage. Jiffy Self-Storage provides the top self-storage units in North Toronto. Call us at (416) 745-4339 or visit contact us here.